Trelliscope provides a way to flexibly visualize large, complex data in great detail from within the R statistical programming environment. Trelliscope is a component in the DeltaRho environment. For those familiar with Trellis Display, faceting in ggplot, or the notion of small multiples, Trelliscope provides a scalable way to break a set of data into pieces, apply a plot method to each piece, and then arrange those plots in a grid and interactively sort, filter, and query panels of the display based on metrics of interest. With Trelliscope, we are able to create multipanel displays on data with a very large number of subsets and view them in an interactive and meaningful way. Another important function of trelliscope is the organization of all of the Trelliscope displays and other visual artifacts we have deemed worthy of presentation into what we call a “visualization database”, which can be easily shared with other researchers in a way that they can interact with. To start getting a feel for Trelliscope, continue to the next section, “Quickstart”. Before getting into the details, we’ll first go over a quick example to provide a feel for what can be done with Trelliscope. This example is adapted from the quick start example in the datadr documentation, but with a specific focus on Trelliscope. First, we need to install the necessary components, datadr and trelliscope. These are R packages that we install from CRAN. Our example is based on a small dataset that we can handle in a local R session, and therefore we only need to have these two packages installed. For support of more scalable back ends like Hadoop when dealing with larger data sets, see the quickstart section on the DeltaRho website. We see that we have a data frame with the information we discussed, in addition to the number of units sold. We create many plots throughout the course of analysis, and with Trelliscope, we can store these in a “visualization database” (VDB), which is a directory on our computer where all of the information about our display artifacts is stored. Typically we will set up a single VDB for each project we are working on. To initialize and connect to a VDB, we call the vdbConn() function with the path where our VDB is located (or where we would like it to be located), and optionally give it a name. # connect to a "visualization database"
This connects to a directory called "vdb" relative to our current working directory. The first time you do this it will ask to make sure you want to create the directory. R holds this connection in its global options so that subsequent calls will know where to put things without explicitly specifying the connection each time. Trelliscope allows us to visualize large data sets in detail. We do this by splitting the data into meaningful subsets and applying a visualization to each subset, and then interactively viewing the panels of the display. An interesting thing to look at with the housing data is the median list and sold price over time by county and state. To split the data in this way, we use the divide() function from the datadr package. It is recommended to have some familiarity with the datadr package. The key tells us that this is Abbeville county in South Carolina, and the value is the price data for this county. To create a Trelliscope display, we need to first provide a panel function, which specifies what to plot for each subset. It takes as input either a key-value pair or just a value, depending on whether the function has two arguments or one. 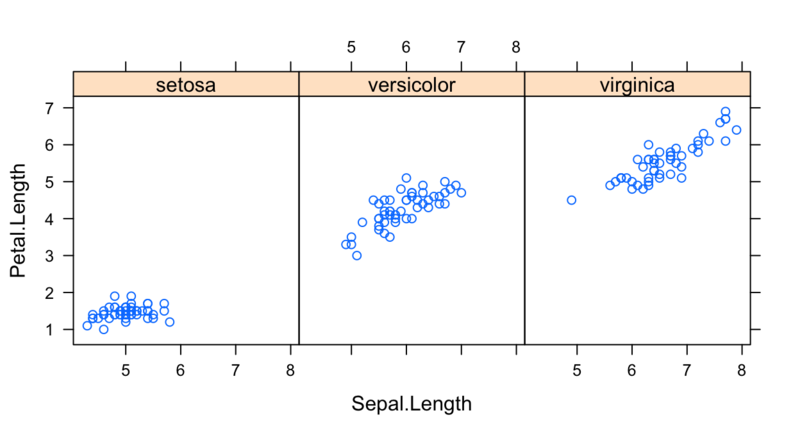 Note that you can use most any R plot command here (base R plots, lattice, ggplot, rCharts, ggvis). We use the cog() function to wrap our metrics so that we can provide a description for the cognostic, and we also employ special cognostics functions cogMean() and cogRange() to compute mean and range with a default description. This creates a new entry in our visualization database and stores all of the appropriate information for the Trelliscope viewer to know how to construct the panels. And select the display with the name “list_sold_vs_time_quickstart”. If you have not been following along but are wondering what that view() command did, you can visit here for an online version. You will find a list of displays to choose from, of which the one with the name list_sold_vs_time_quickstart is the one we just created. This brings up the point that you can share your Trelliscope displays online – more about that as well as how to use the viewer will be covered in the Trelliscope tutorial – but feel free to play around with the viewer and see what you can discover. This covers the basics of trelliscope. Hopefully you now feel comfortable enough to dive into the rest of the tutorial. Trelliscope is based on the notion of multipanel displays. A multipanel display is one in which the data is split into subsets, typically based on the values of one or more conditioning variables. A plot function is applied to each subset, and each plot is called a panel. The multipanel display arranges the panels in rows and columns, reminiscent of a garden trellis. There are many compelling reasons for this simple visualization approach, and we point the curious reader to more information about this, in particular, Trellis Display, and small multiples. To illustrate multipanel displays, we will show examples on a small but famous data set, the iris data, which gives the measurements in centimeters of the sepal and petal length and width for 50 flowers from each of 3 species of iris. The species are setosa, versicolor, and virginica. 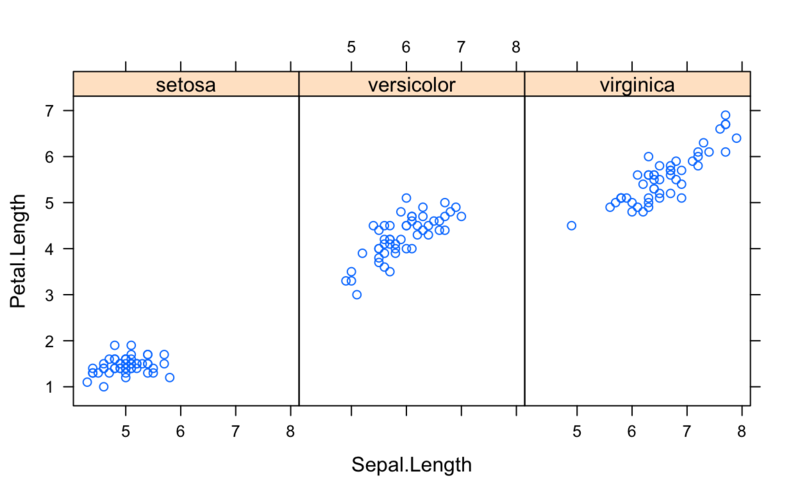 Here we specify that we want to plot the petal length against sepal length, with the | operator indicating that we want a panel for each species. Hence species is our conditioning variable. We also specify that we would like to lay out the panels as 3 columns and 1 row. Notice that the . There are many important aspects of multipanel display that are good to grasp before making Trelliscope displays, and we will cover a couple of these next, axis limits and aspect ratio. We will illustrate each of these using the lattice xyplot() function since they are readily implemented. Understanding how to use these settings with xyplot() is not extremely important - we will handle that when we start making Trelliscope displays. But understanding the concepts and importance is the focus of this section..
Every panel’s x-axis of Sepal.Length starts around 4cm and ends around 8cm, and every panel’s y-axis of Petal.Length ranges from around 1cm to 7cm. Choosing “same” axis limits helps emphasize that the means of both Sepal.Length and Petal.Length are significantly different for each species. We can also judge that the Petal.Length appears to change in variability for each species. 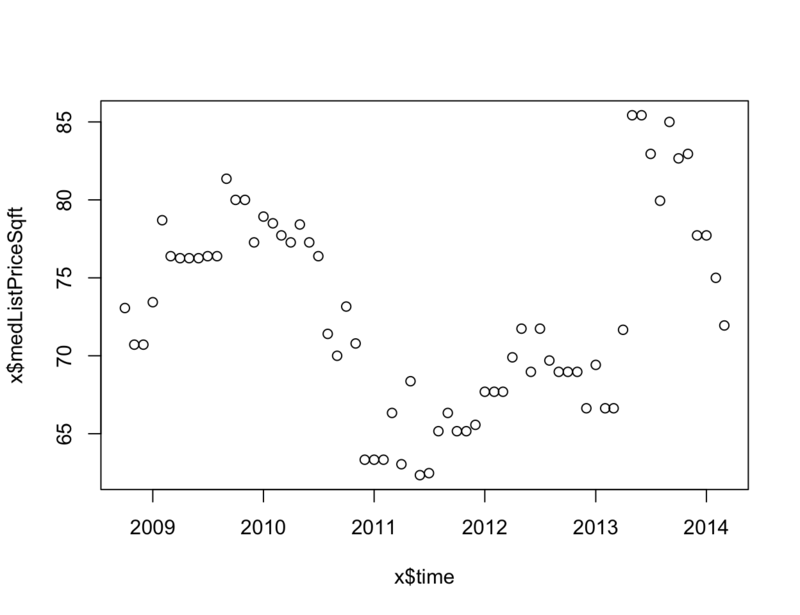 “Same” axes are the default setting for xyplot() and are in general a good default choice. The plotting function pre-computes these axis limits across the whole data set and sets them for us. Now, if we look at the x-axis, we see that each panel has a range of about 3cm (for example, the panel for the setosa species ranges from 3.5cm to 6.5cm) and similarly for the y-axis. We can no longer easily make judgements about how different each species is in terms of the mean (to do that, we have to actually look at the axis labels, which is not very effective). But now the change in variability across species is much more clear. 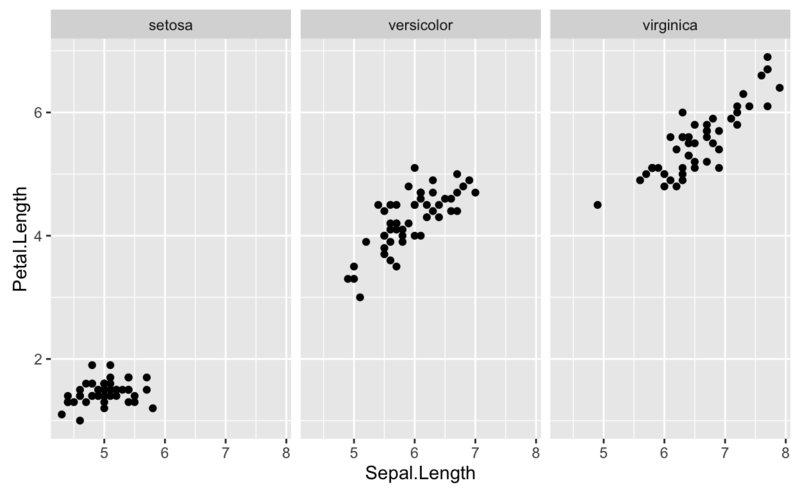 For example, measurements for setosa are less variable around their mean than for the other species. Choosing “sliced” axes is useful for when we do not care as much about differences in location or when the location of the data for each panel has such a large range that “same” axes keep us from seeing the detail in the data. Now it is much more difficult to make useful comparisions across panels, but choosing “free” axes can still be a logical choice when we just care about seeing the full resolution of the data within each panel. Determining suitable axis limits is dependent on what is being visualized, but typically “same” or “sliced” are good choices as they enable panel-to-panel comparisons, which is where much of the power of this type of visualization lies. You might choose “sliced” if you are interested in relative behaviors in terms of scale, or “same” if you are interested in relative behaviors both in terms of location and scale. You can make different choices for each axis individually. It is also often helpful to make multiple versions of the same plot with different axis limit settings for different purposes. In lattice, the handling of panel axis limits is specified by the scales argument, as we have seen, and we will see that there is a similar notion in Trelliscope. It is also always possible to manually compute the limits we would like and hard code them into our panel plotting function, although as important as axis limits are, Trelliscope tries to make their use as straightforward as possible. This section will be short, but the message is important: in multipanel display (or any display for that matter), aspect ratio matters. The aspect ratio of a plot is the measure of the height divided by the width of the box bounding the plot area. The choice of aspect ratio can drastically effect your perception of interesting features in a plot. 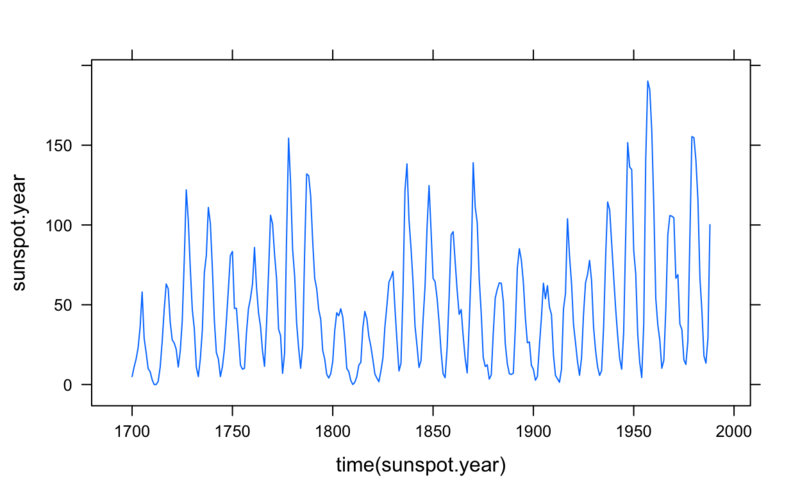 A famous example comes from the built-in R data set sunspot.year, which gives us the yearly numbers of sunspots from 1700 to 1988. Below are two plots of the same data, each with a different aspect ratio. 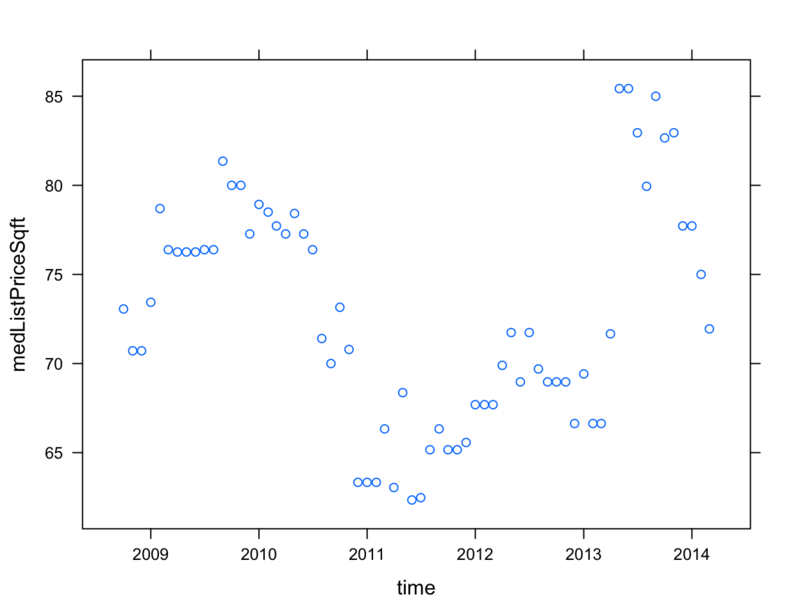 If we look at the data in the top plot, we see an obvious cyclical behavior in the number of spots. However, the bottom plot emphasizes something that was much more difficult to see in the top plot, namely that the sunspot activity that ramps up very quickly tends to taper off more gradually - a very important insight that has implications for how the data is modeled. In Trelliscope, we will see that the aspect ratio is simply specified by providing the panel bounding box dimensions. Never let the choice of aspect ratio be chosen by what you think is a convenient panel size for looking at (e.g. square) - choose it wisely. There are helpful tools to assist the choice of aspect ratio, such as banking to 45 degrees, but often the choice is a subjective but informed one. We can expect to need to need a variety of pictures to look at a data set of any complexity. We have found this to be true for every analysis we have been involved in. When creating so many displays, and particulary for Trellis Display, it becomes important to be able organize them. 1. any object made by human beings, especially with a view to subsequent use. Trelliscope provides a mechanism to organize and store visual artifacts in a visualization database (VDB). Typically we create a VDB for each analysis project we are working on. Within a VDB, displays can be organized into groups by analysis thread. Artifacts in a VDB can either be simple plots created from various R plotting packages, like the ones we have seen so far, or Trelliscope displays, which are displays created for a divided dataset with a potentially very large number of subsets. Trelliscope provides a way to view and interact with displays in a VDB, as well as easily embed them in a web-based “lab notebook” - a more organized presentatin of the progression of an analysis, which we discuss in the Viewing Displays and Lab Notebooks sections. With the fundamentals down, we are now ready to start creating some Trelliscope displays and getting into some details. Before we create our first display, we need to initiate and connect to a visualization database (VDB). A VDB connection is simply a pointer to a directory on disk where all of the VDB files reside or will reside. If the VDB connection directory doesn’t exist, it will ask whether it should be created. Giving the VDB a name is optional, but will be useful for later when we sync our VDB to a web server. The name can be overridden by specifying a new one. Most Trelliscope functions need the VDB connection information to know where to put things. It can be tedious to always supply this, so vdbConn() sets a global R option called "vdbConn" that holds the connection information. If in a Trelliscope function we do not explicitly specify the connection, the default is to search for the global vdbConn option. The assumption is that in any one R session, the user will be using just one VDB, and thus there will not be multiple conflicting connections. We can now look at some examples and start populating the VDB with displays. Since Trelliscope is a multipanel display system, the first step of creating a display is to break the data into subsets, with each subset representing the data to go in one panel of the display. For a given data set, there can be multiple meaningful ways to split the data. We achieve data partitioning through the datadr package, the companion package to Trelliscope. This package implements the Divide & Recombine (D&R) approach to data analysis. If you have not spent time with datadr, we cover enough in this section to scrape by, but we highly recommend that you spend some time with the datadr tutorial. The datadr package provides a mechanism for dividing potentially very large data sets into subsets, applying analytical methods to each subset, and then recombining the results in a statistically valid way. Here, we use datadr to partition our data, and then Trelliscope will provide a visual recombination. We will stick with the housing data we saw in the quick start section throughout the remainder of this section, but going beyond the quick start, we will focus on several details and provide more in-depth explanations for what is happening. There are many ways we might want to split up this data - by year, by state, by state and county, etc. Here, we will divide by state and county as we did before. The result is a key-value pair, with the key indicating that the subset corresponds to Abbeville County in South Carolina. The value contains the data frame of data we will want to plot. We have our division. Now we are ready to make some displays. To quickly get our feet wet with creating a display, we start with a minimal example. Creating a plot first requires the specification of what you would like to be plotted for each subset, a panel function. The function is applied to each key-value pair subset in your data. This function behaves like all other per-subset functions in datadr, which can operate either on both a key and a value of just the value (see here for more details). Although we have been mainly referring to lattice and have been showing examples with lattice, you do not need to use lattice in your panel function – you can use base R graphics, lattice, or ggplot2, etc. The two most important arguments are the first argument, which is the data to plot, and the panel function, panelFn. The other arguments in this example simply identify the display. We will later see other arguments to makeDisplay() that provide additional useful functionality. This will bring up the Trelliscope viewer in a web browser. Note that this viewer is designed for modern web browsers and Internet Explorer is not recommended. If you aren’t following along with the example in your own R console, we have pushed this VDB out to RStudio’s shinyapps.io site here. What you should see in the web browser is a modal box with the title “Open a New Display”. If at any point you want this box to come back up to choose a display, you can bring it up by clicking the folder icon in the top right of the viewer window. This will give you a list of displays to choose from. At this point, there will be one or two displays, depending on whether you ran through the quick start. We want to select the display we just created, which we named “list_vs_time_barebones”. We can do this by clicking the appropriate row in the list of displays. This brings up the display in the viewer, showing the first panel of 2883. You can use the arrow keys to navigate from one panel to the next. While we will provide a more in-depth tutorial on the viewer later, at this point feel free to experiment with some of the viewer features available along the left panel. The options are broken down into two categories, “View Options” and “Cognostics”. We will talk about cognostics later in this section, and there is not too much interesting to do with cognostics for this example. But it is worth taking some time to experiment with the options available in these controls, many of which are self-explanatory, keeping in mind that no harm will be done to the display. When dealing with large data sets that get partitioned into subsets that number in the thousands or hundreds of thousands, it begins to be infeasible or ineffective to look at all every panel in a Trelliscope display. For our county example, if we put enough panels on one page, we can page through all ~2900 panels fairly quickly. But even in this case, we would benefit from an effective way to call panels to our attention that are of most importance, based on different criteria. We can do such a thing in Trelliscope using cognostics. There seems no escape from asking the computer to sort out the displays to be displayed… To do this, the computer must judge the relative different displays, the relative importance of showing them. This means calculating some “diagnostic quantities.” … It seems natural to call such computer guiding diagnostics “cognostics”. We must learn to choose them, calculate them, and use them. Else we drown in a sea of many different displays. For our purposes, a “cognostic” in Trelliscope is essentially any single metric about one subset of data that describes some aspect of that subset. We can compute any number of cognostics for a given display, and then in the Trelliscope viewer we can sort, filter, or sample our panels based on these metrics. Metrics can include statistical summaries, categorical variables, goodness-of-fit metrics, etc. We will see several examples in this section. The cognostics function is applied to each subset just like the panel function and must return a list which can be flattened into a data frame. For our data, there are several cognostics we might be interested in. Typically the most useful cognostics are arrived upon iteratively. Here, we specify the slope of a fitted line of list price vs. time, the mean list price, the number of non-NA list price observations, and finally, a special cognostic that is a URL that links to a Zillow display of homes for sale in the county. Note that each metric is wrapped in a function cog() or cog*(). Doing so allows you to control the type of variable and give it a description, which will be useful in the viewer. The helper functions cogMean(), cogRange(), cogHref(), etc. can be used when defining the cognostics list. They are not necessary but can be helpful. For example, the difference between cogRange() and range() and others is that there is removal of NAs and extra checking for errors so that the cognostic calculation is robust. Now, when we view this display (which again we can do with view() and selecting the appropriate display from the list), we can use the cognostics to interact with the panels. For example, in the “Table Sort/Filter” control panel (clickable from the list of options on the left), we can sort or filter the panels baed on any of these metrics. 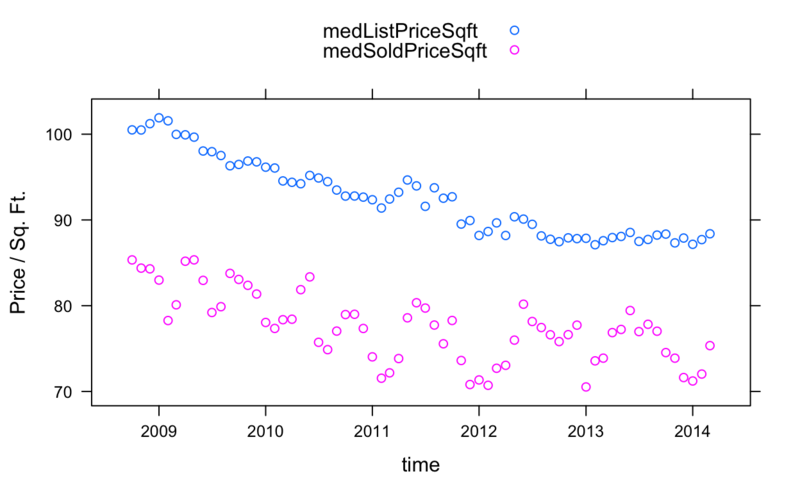 We can look at counties for only select states, sorted from highest to lowest mean list price, for example. The additional controls, such as “Univariate Filter” and “Bivariate Filter” allow us to look at plots of the cognostics and visually filter panels. We will cover this in greater detail in the Viewing Displays section, but feel free to play around right now. Also, use your imagination for what some other useful cognostics might be and try to add them. As we discussed before, giving consideration to axis limits is very important for creating meaningful Trellis displays. In Trelliscope, axis limits can be computed by specifying the x and y axes as “free”, “sliced”, or “same”. The default axis limit specification is “free”, as we saw in the display we just created - each panel’s axis limits are bound by the range of the data in each subset. Since Trelliscope is very general - any R plotting technology can potentially be used in a panel function - the default is to not try to do anything with axis limits. Note: the discussion in this section is constrained to two-dimensional panels (with x and y axes), which covers the vast majority of useful statistical visualization techniques. If you have panel functions that produce plots that do not have quantitative x and y scales (e.g. pie charts - no!! ), then the functionality described in this section is not useful. To be able to compute overall axis limits for a display, Trelliscope needs to know about the range of the data in each panel. Thus, when we create a display with “same” or “sliced” axes, Trelliscope must pass through the data and make these computations. There are two ways in which Trelliscope can make the per-subset range calculations. The first is by simply using the panel function itself. This is the easiest approach, but currently only works with lattice and ggplot2 panel functions. The second approach is to specify a prepanel function. We will cover both of these in this section. To specify axis limits with a panel function, our panel function needs to use lattice or ggplot2. This is because these return plot objects from which we can extract the range of the data in the plot. If you view this display by calling view() and selecting it, you will see that the y-axis now ranges from about 0 to 1500 for every panel and the x-axis ranges from 2009 to 2014 for every panel - they are the “same” across panels. You might notice that a y-axis range of $0 to $1500 per square foot is a very large range, and there are probably only a very small number of counties that are in that higher range. This causes the interesting features such as large relative dips in price within a county to be washed out, and might want us to think more about our choice of axis limits for the y-axis. We will discuss this in more detail below. Note that since “free” is the default, we could have omitted y = "free" in the lims argument above. The previous example is the most simple way to specify axis limits. However, it comes with a potential cost – the panel function must be applied to each subset in order to obtain the limits. For panel functions that take some time to render, this is wasted time. As an alternative, we can explicitly supply a prepanel function to the lims argument list, called prepanelFn. This notion will be familiar to lattice users. In both of the above approaches, we computed axis limits at the time of creating the display. This is not recommended for data with a very large number of subsets. There are a few reasons for this. Setting the axis limits based on “sliced” or “same” is not very robust to outliers, and we may wish to understand and modify the axis limits prior to creating the display. Computing the axis limits can be more costly than creating a display, and it can be good to separate the two, particularly when we may be iterating on getting a panel function just right. We can use a function, prepanel(), to compute and investigate axis limits prior to creating a display. The main parameter to know about in prepanel() is prepanelFn, which operates in the same way as we saw before – it is either a lattice or ggplot2 panel function or it is a function that takes a subset of the data as an input and returns a list including the elements xlim and ylim (each a vector of the min and max x and y ranges of the data subset). Another option, of course, is to set axis limits explicitly in your panel function to whatever you like to achieve the effect of “same” or “sliced”. The default behavior for how panels are stored is to store a reference to the input data object and then render the panels on-the-fly in the viewer, pulling the appropriate subsets from the data as necessary. Thus, if we have a very large ddo/ddf input object on HDFS, we do not make a copy for visualization, and only have to render the images being requested at the time of viewing. When calling makeDisplay(), only the prepanel and cognostics computations need to be done. There is an option to pre-render, which can be useful when rendering the image is compute-intensive. However, this feature is still being developed and is currently not recommended. We typically have many different ways to look at the same division of data. When creating a display against a divided dataset, Trelliscope keeps track of the division of the input data, and all displays created on the same division can be linked together in the Trelliscope viewer. Often our D&R environment and VDB are on a local workstation. We might build up our VDB and web notebook locally and then desire to sync the results to a web server which is running Shiny Server. This is very useful for sharing analysis results with others. There is some simple support for this in Trelliscope. You can initialize a web connection using webConn(), which assumes that your web server is a Linux machine to which you have passwordless ssh capability. You specify the address of the server, the directory of the VDB, and the name of the VDB under which you would like things stored. Please see here for a guide to the Trelliscope viewer. You can go through most of the examples we’ve seen so far in this tutorial with a simple installation of R and the Trelliscope package and its R package dependencies. To deal with much larger datasets, scaling comes automatically with Trelliscope’s dependency on datadr - any backend supported by datadr is supported by Trelliscope. These currently include Hadoop and local disk. Here is a quick example of how to create a Trelliscope display using input data that is stored on local disk. This will prompt that it is okay to create this directory. The input connection is saved with the display object, and the data is used as the input when panels are rendered. If we want to pre-render the panels, we can specify an argument output, which can be any datadr data connection. Since we will be pulling data at random by key from this object, we need to convert it to a Hadoop mapfile using makeExtractable() (datadr tries to make things mapfiles as much as possible, and makeDisplay() will check for this and let you know if your data does not comply). What should I do if I have an issue or feature request? Please post an issue on github. If you would like to run through all of the code examples in this documentation without having to pick out each line of code from the text, below are files with the R code for each section. All but the final section on scalable backends should run on a workstation with no other dependencies but the required R packages. The scalable backend code requires other components to be installed, such as Hadoop or MongoDB.